Hello, Friends! 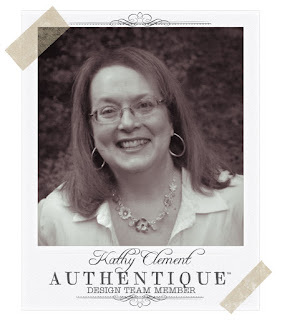 I'm thrilled to be sharing another of my guest designer posts for Authentique Papers. 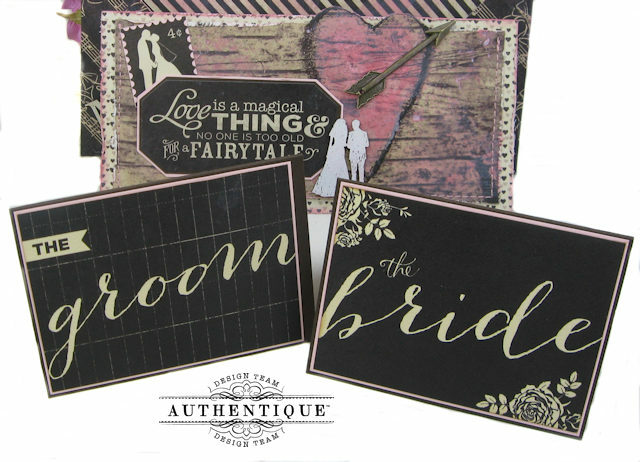 This time, I'm featuring a pair of wedding themed projects made with the Authentique Always Collection. 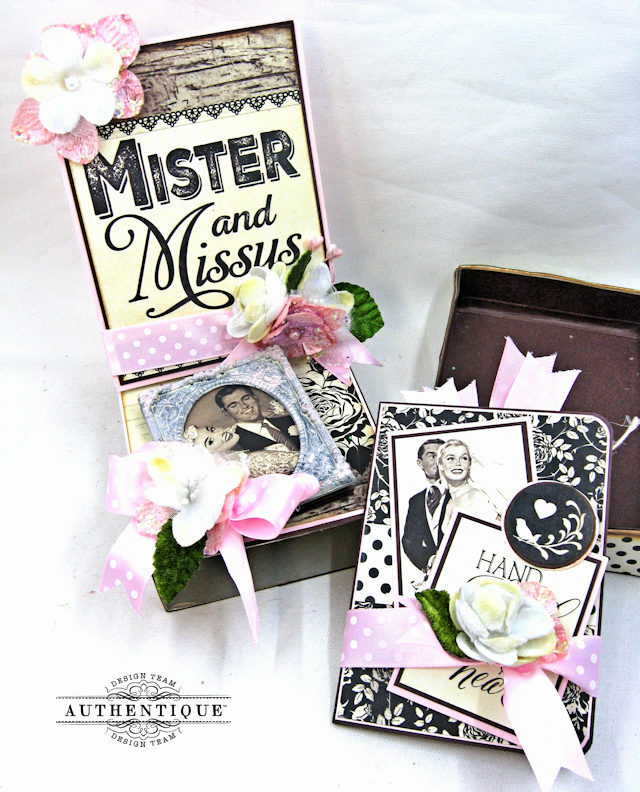 Both projects provide a unique way to present a gift card for the Bride and Groom and are both easy to make. Let's get started! The Always collection is done in gorgeous shades of brown and cream. Honestly, it is so rich and elegant that it makes me think of deep dark espresso with whipped cream on top. 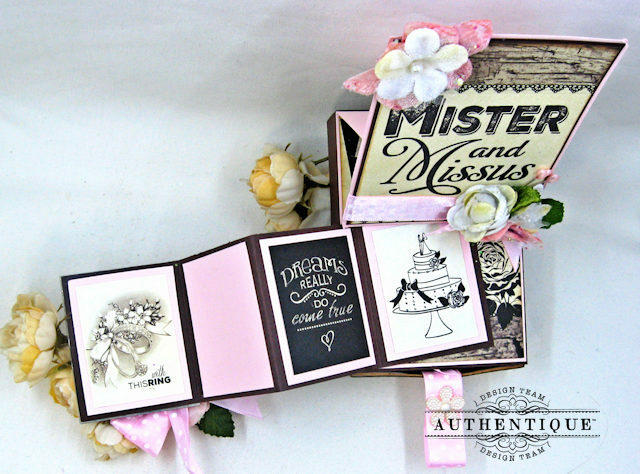 This little easel style gift box measures about 3.75" x 4.25" and it's just the right size for the journal cards from the 12x12 paper collection. 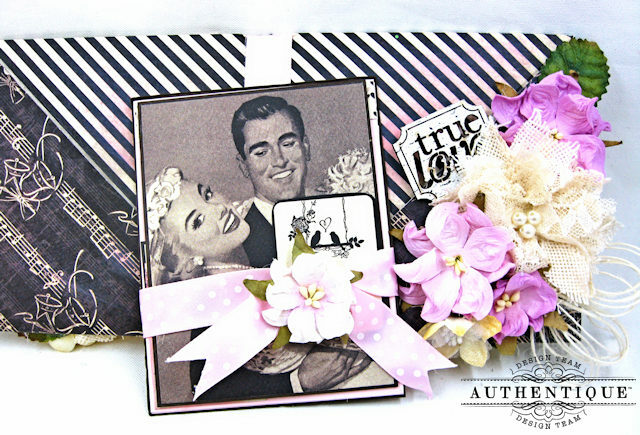 Making this pretty gift box is so easy! I just covered the box base with designer paper from the Always 6x6 pad, then made a sweet little easel card that matched the size of the box top. 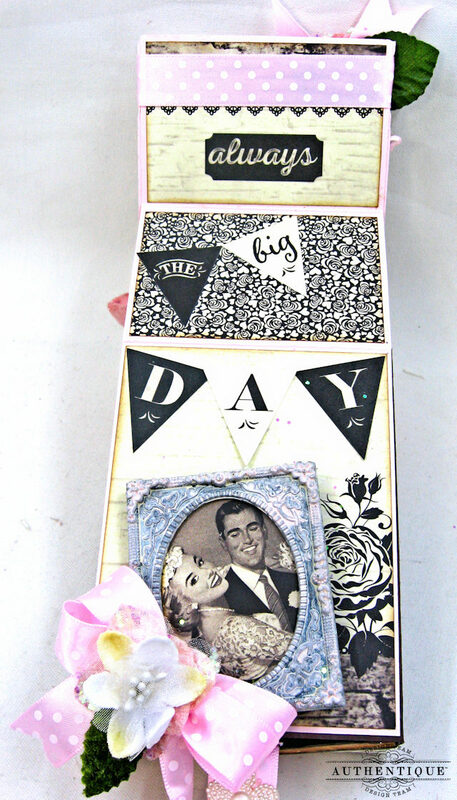 Then, I glued the card base to the top of the box. 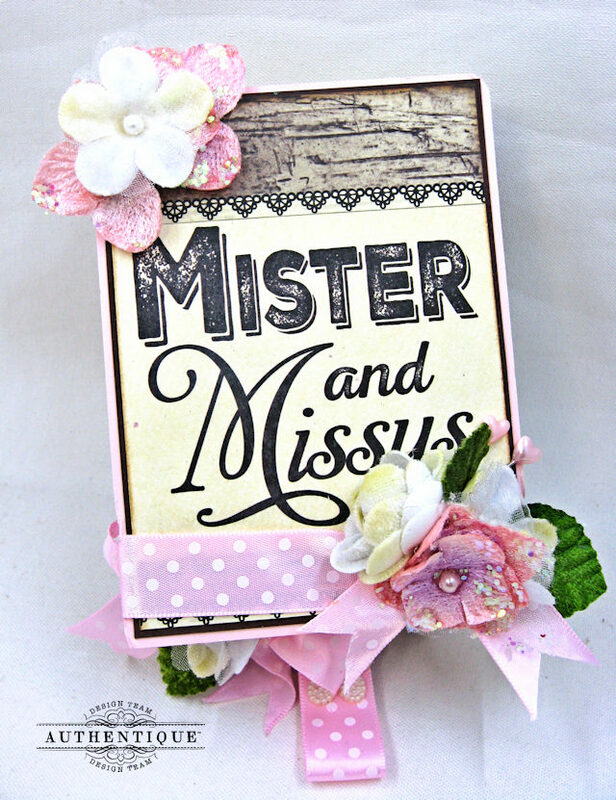 I think this would look fabulous as table decor at a wedding, bridal shower or rehearsal dinner. 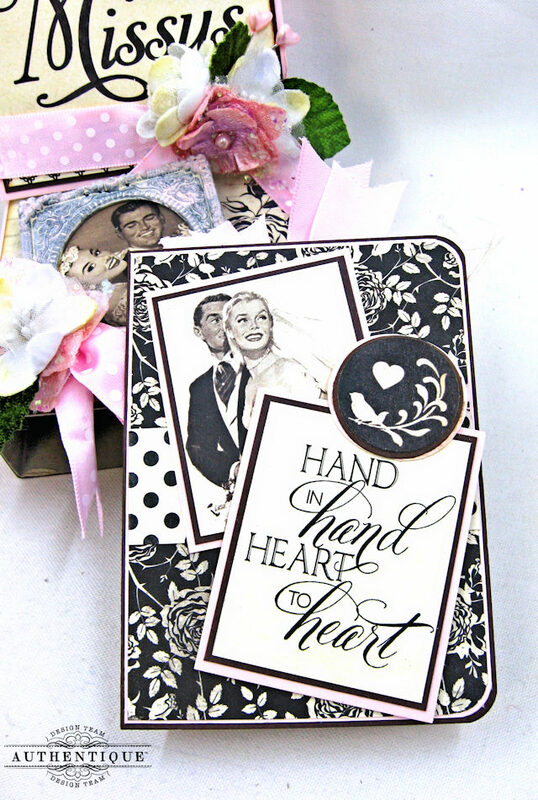 Use an image from the 6x6 pad with a Tim Holtz Vintage Cameo Frame and you've got a lovely cover for a mini folio! Paint the frame with Tattered Rose Distress paint to give it a shabby chic finish. 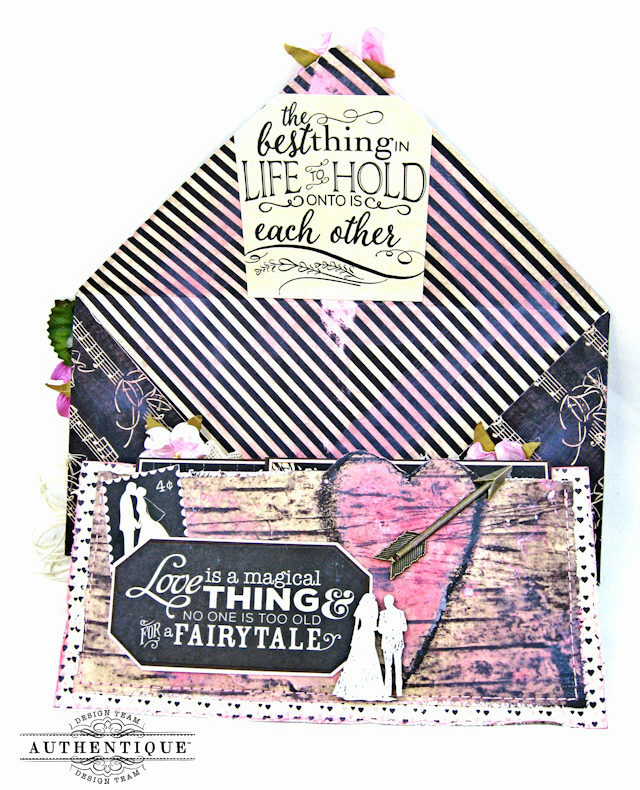 Accordion fold a strip of cardstock, then decorate with images from the 6x6 collection. 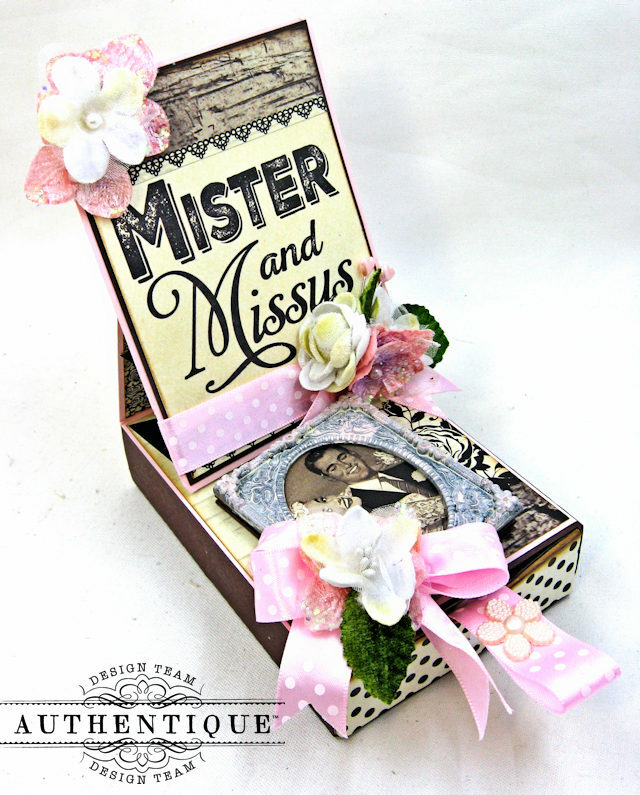 Leave one panel open for a small photo booth style shot of the new Mister and Missus! Inside the box, I've created a mini sized folio that measures 2.75" x 3.75". 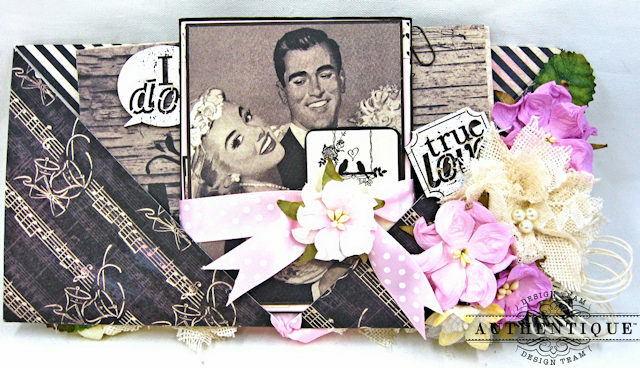 Decorate the front with images from the 6x6 pad and create a belly band closure with ribbon and Petaloo Flowers. 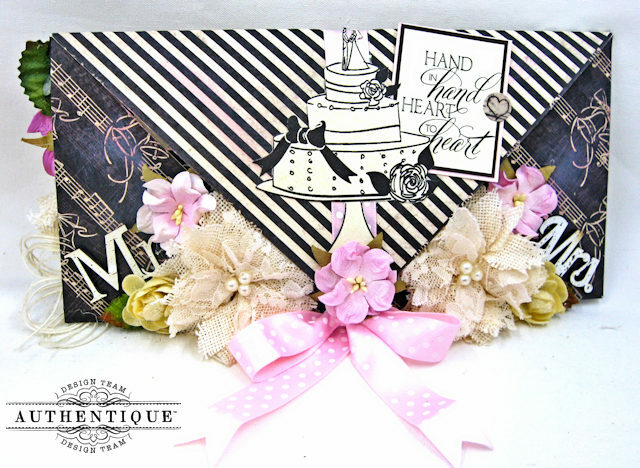 My dear friend Liz Gaze shared a great tutorial for this lovely envelope card. I made a few changes to the design to make this fun folio that I've filled with a gift wallet and other goodies. The 8.5" x 4.25" envelope is made with one sheet of 12x12 paper. Just fold the paper following the simple directions in Liz' tutorial and in about 2 minutes, you have made the base for this project. Brush your paper with Worn Lipstick Distress ink to add color to the basic brown and cream color palette. 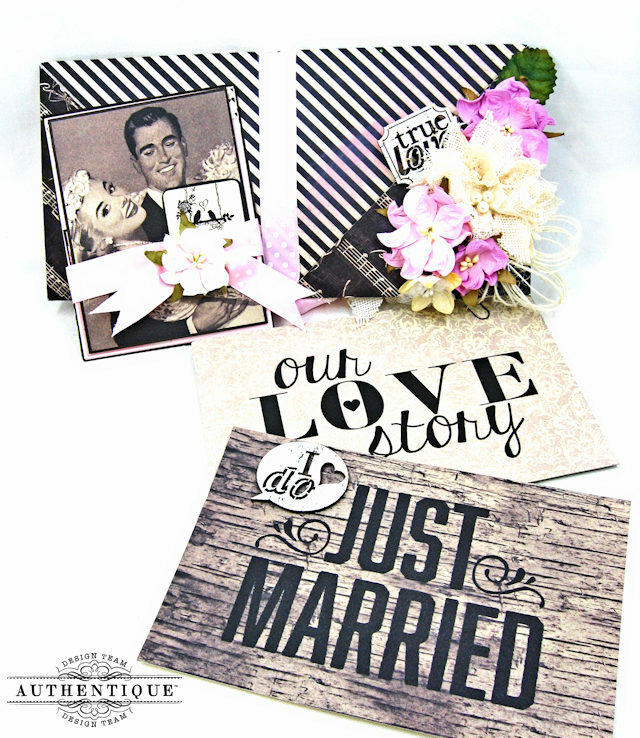 The fact that these papers are so neutral means that no matter what your wedding colors are, you can match them by adding the appropriate color ribbon, flowers or even ink. After distressing the edges of some 12x12 paper, I stitched them together on my sewing machine to create a wallet. Inside the wallet, I created a pair of gift card holders. First, cut a 7.25" x 4.25" rectangle of brown cardstock. Next, score on the long side at 3.25" and again at 6.5". Now, use a 3/4" circle punch to add a thumb hole to the 3.4" strip. 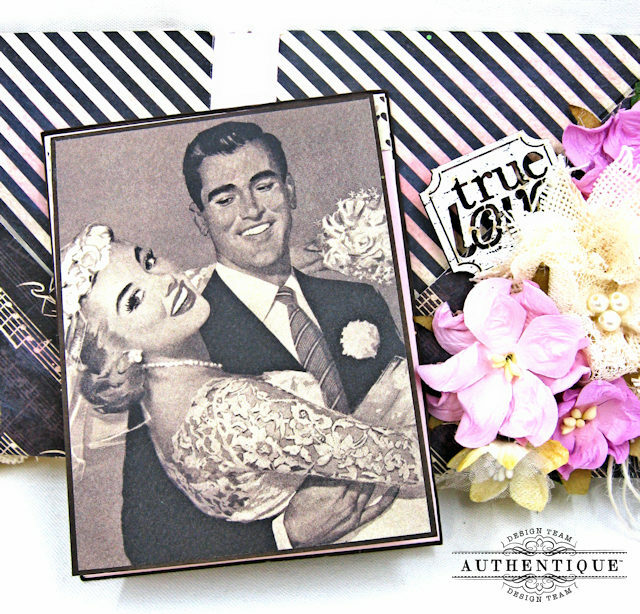 Tuck in a small journal card from the 6x6 collection. 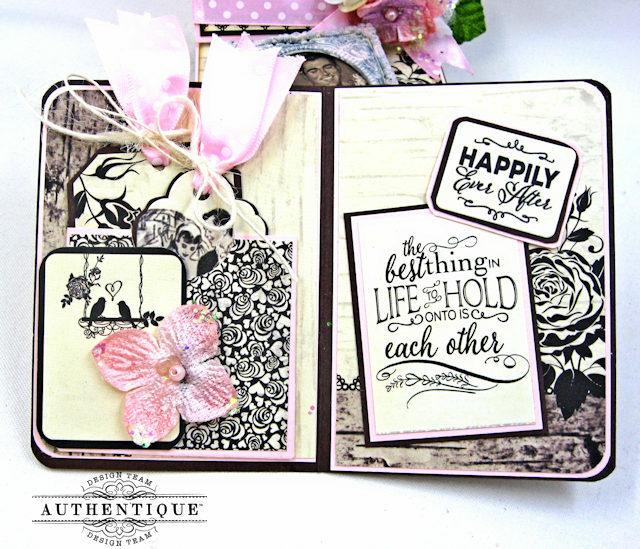 These 4x6 journal cards from the 12x12 cut apart page make wonderful inserts. I added a little wooden icon and a mini paper clip to hold them together. Doesn't this couple look romantic? I know it's hard to really get a feel for how everything works together when all you see are still photos. So I put together a short, 10 minute, video tour with more info and tips for making these two projects. I hope you enjoy! I've provided product links below for your convenience. 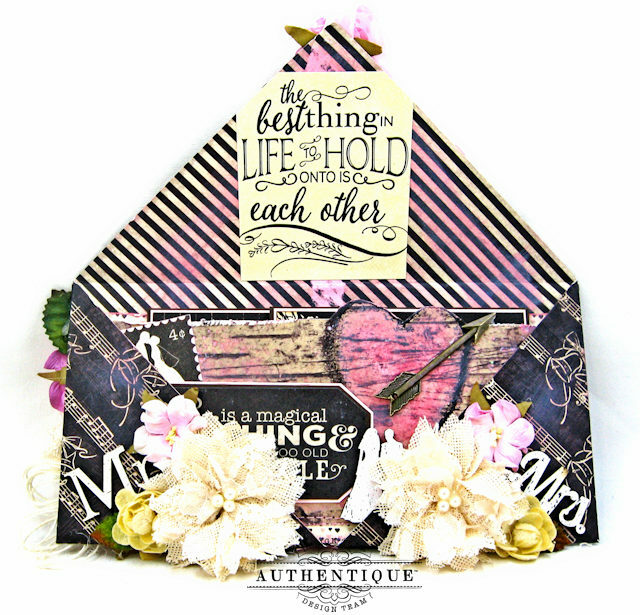 I hope I've shared some ideas and tips that you can use in your own crafty adventures. If so, I'd love to hear from you in the comment section below. Thanks for stopping by! 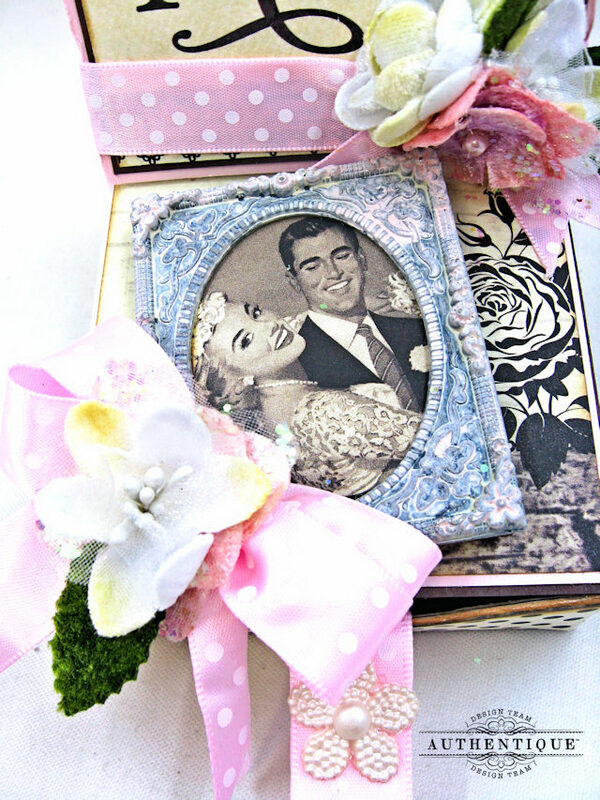 Other Supplies: Petaloo Flowers (Penny Lane Darjeeling Wild Roses, Soft Pink, Textured Elements Ivory Burlap Birdnest Flowers, White Vintage Velvet Minis, Ivory Mixed textured Blossoms, Pink Velvet Hydrangeas), Ribbon (Ivory Burlap String, Pearl Pink Satin Swiss Dot Ribbon), Idea-Ology Foundry Frames, Adornments Arrows, Something Blue Wood Icons, 3 sheets of 8.5" x 11" chocolate chip cardstock, 3 sheets of 8.5 x 11" pale pink cardstock, normal paper crafting tools like paper cutter, rulers, glue guns, etc. Love all of these terrific ideas!! Great inspiration with so many choices! Love the first one for wedding deoration!